We see and experience them every day and they’re everywhere. Their mission is to make you less productive. They come in different shapes and sizes. They can be addicting and hard to resist. They’re in your home, your office, all over the web, and on our phones. Some may have conditioned you to believe they’re helpful and productive. They can be pleasurable in the short-term but stall success in the long-term. They murder time and kill productivity. So what are these horrible things? They’re called Distractions. 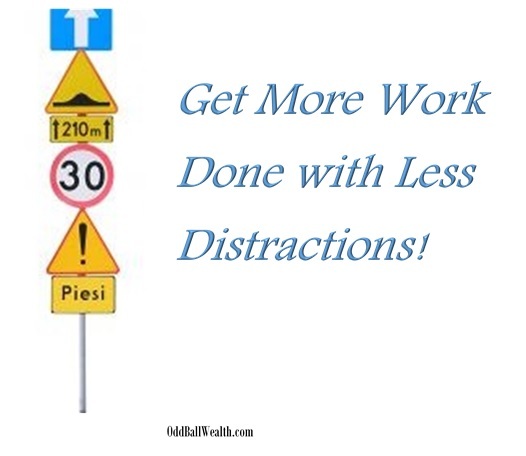 Fortunately, there’s ways to easily avoid distractions and keep them at distance, allowing you to be more productive. Distractions and unimportant tasks can really make for inefficient use of your time. We’re going to talk about how to make better use of your time, avoid distractions, and become more productive. Make this list the day before preferably right before you go to bed. Your mind will process the tasks while you sleep. When you wake up the tasks will still be fresh in your mind. After you finish writing your list you’ll need to prioritize it by making the most important items the first to do. As soon as you wake up in the morning begin completing these tasks. Make it your mission to have the tasks completed before lunch each day which is around 11 am and 12 pm for most people. Get in the habit of creating a “to do” list daily. By making a task list before you go to bed, your mind will process the tasks while you sleep. When you wake up you’ll have complete focus of all the tasks needed to be completed. By making it a priority to have these task completed before lunch time (11 am or 12 pm) you avoid time-consuming distractions and will have completed tasks that use to take you all day to do making your day more enjoyable. People check their email to avoid or put off doing another less favorable task. We’ve been conditioned to believe checking email frequently is important and productive. People check their email frequently because they believe you have to. People worry they’ll miss an important email or not respond to an email in a timely fashion. If the message is that important the sender will get the message to you another way. For now on only check your email twice a day, once during lunch time and once at the end of the day. It’s also not a good idea to check your email in the morning after you wake up. You’ll become distracted and lose focus on your “to do” list (which you need to have completed before lunch). The first time you check your email each day should be around 11 am or 12 pm. During this time you can respond to any emails you received that morning and the night before. Now that you’re only checking your email twice a day you’ll become more efficient and it’ll be easier to focus on other tasks. If you’re worried people are going to think you’re ignoring them because you’re not responding to their emails immediately set an automated email message. The automated message can inform the person that sent you an email the times you check and respond to emails. This will give the sender an estimated time to when they’ll get a reply from you. This might sound rational but try to get out of the habit of reading or watching the news every day. If you think about it the news doesn’t change that much from day to day. Many times the news is full of negative events like, “what’s going wrong in the world.” Negative events in the news can throw off your positive outlook for the day, making your day less productive and enjoyable. Reading and watching the news daily is distracting causing you to lose focus of tasks that need completing. Nothing bad will happen to you if you don’t get a newspaper every day, I promise. Now that you’ve ditched the paper, permanently block news and media sites on web browsers at work or the office and on any other computer or device you use for business purposes. If feel you need to read the news at least wait until the workday is over and you have completed all of your daily tasks although I would suggest reading a good book instead. If feel you need to read the news at least wait until the workday is over and all your daily tasks have been completed. I suggest reading a good book instead of the news. Every workplace has that person who walks around the office looking to engage others into conversation on topics that are generally unrelated to work. This type of individual(s) is a workplace distraction who you want to try and avoid. You can easily do this by politely telling the person you’re busy and can’t talk at the moment but would be happy to take up the conversation with them outside of working hours. By not engaging in time-consuming conversations on topics not important to your work you’ll stay more focus and productive. Cell phones can also be a distraction if you get personal phone calls during the day. To avoid cell phone distraction, tell your contacts to only call you during work hours if it’s an absolute emergency. These are simple techniques that anyone can implement to free up time and be more productive during the day.